Drs. 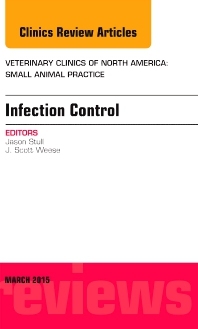 Stull and Weese have assembled an expert panel of authors on the topic of Infection Control. Articles include: Hospital-associated infections, Surgical site infections, Surveillance for Hospital-associated infections, Hand hygiene and contact precautions, Patient management, Environmental cleaning and disinfection, Equipment cleaning and disinfection, Antimicrobial Stewardship, Worker safety, Zoonotic disease and infection control and Legal implications of zoonotic disease transmission for veterinary practices.